This Saturday, September 29, drag artist Donna Sachet, often referred to as "the first lady of the Castro," will be the target of a roast at the Castro Theater. 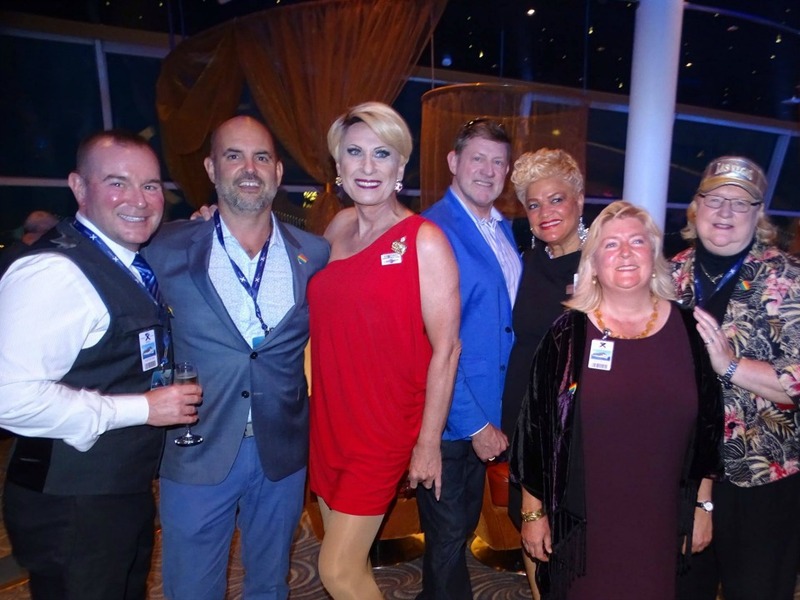 The roast, hosted by comedian Bruce Vilanch, will feature good-natured barbs from LGBT luminaries such as fellow drag artist Heklina, activist Cleve Jones, former mayoral candidate Mark Leno, and Sister Roma, among others. A portion of the proceeds will benefit the GLBT Historical Society. Long a fixture in the neighborhood, Sachet (nee Kirk Reeves) has been the recipient of many awards for her fundraising efforts across the community. 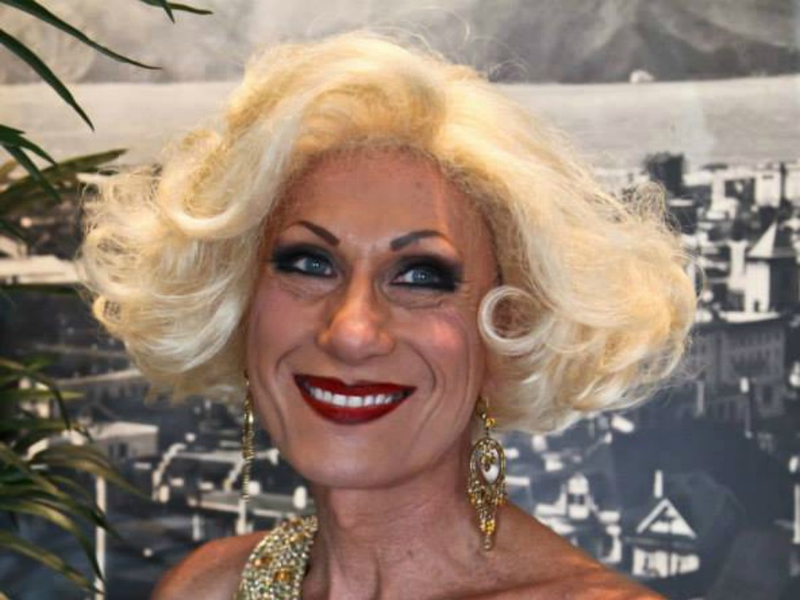 A former Grand Marshal of the San Francisco Pride Parade, she was elected by the Imperial Court System as the 30th Absolute Empress Of San Francisco, and has served on the boards of a variety of community organizations. Sachet (in red) with friends. Born in South Carolina, Sachet attended Vanderbilt University, then lived in New York. She came to San Francisco from New York for a job promotion with a major fashion retailer, and at first, she was wasn't happy with the slower pace of the city. "After a year of frustration, I decided I needed to work harder to be a part of this city," she said. "So I cancelled my New York Times subscription, started volunteering after work, and joined the San Francisco Gay Men's Chorus. What a difference that made!" It was at a Gay Men's Chorus retreat that she first developed her drag persona. "Although I had privately played with drag, I had never been open about it and certainly never performed in drag," she recalls. "I nervously lip-synched a Donna Summer song; she being black and me being white, I named myself Donna Winter. As I left the stage to what I remember as thunderous applause, I heard someone say 'Look at her sashay!' I changed my name on the spot to Donna Sachet." 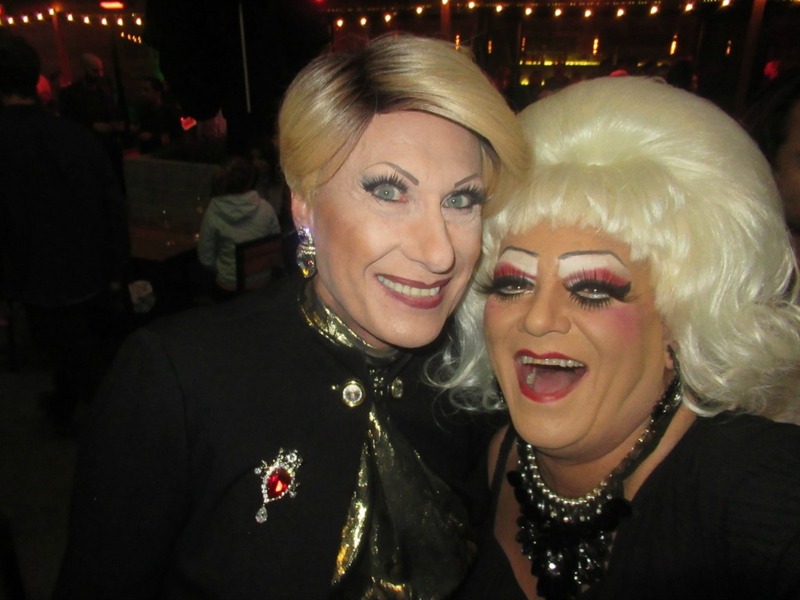 That single talent-show appearance launched a drag career of more than three decades, including the weekly Sunday's a Drag shows she's hosted at the Sir Francis Drake Hotel for more than 10 years. In 2009, Sachet became the first drag performer to sing the national anthem for the San Francisco Giants at AT&T Park, an experience she calls "incredible." But she's equally well-known in the Castro community for her commitment to volunteering. "My early volunteer work consisted of licking envelopes and hanging flyers," she said. "But I think my business background led me to leadership positions, and eventually seats on boards." Sachet has served on the boards of the LGBT Community Center, Equality California, GLAAD, Imperial Council, Positive Resource Center, and the International Court Council, and is currently on the board for theRainbow Honor Walk. Sachet with fellow drag artist Mutha Chucka. Being called the "First Lady of the Castro" can be intimidating, Sachet says, "but it's a welcome recognition of my commitment to this neighborhood I love. I rarely turn down an opportunity to host an event, cut a ribbon, or represent the Castro, wherever I may be." While she says the neighborhood has certainly changed in the last 25 years, Sachet points out the Rainbow Honor Walk's bronze plaques, the GLBT History Museum, and improvements to the Holocaust Memorial Park as positive additions. "When I think of needed improvements, I hope for longer range," she said. "More visionary planning for Harvey Milk Plaza and Jane Warner Square. Commercial and residential rents are too high ... And the tragedy of homelessness is glaringly evident in the Castro, though people who live and work here do care and are working in a variety of ways to address these and other issues." Sachet hopes people will get involved and be part of the solution. "While the streets may not have the free-for-all swirl of yesterday, the Castro still invites the attention of the world and provides a palpable pulse of our thriving LGBTQ community," she said. Despite a hectic schedule of performing and volunteering, Sachet says she prioritizes taking time for herself. "Time out is important," she said. "I try to maintain my 'Do Nothing Monday' rule, sometimes never leaving home, getting dressed, nor communicating with the outside world for 24 hours. During that down time, I love to read -- especially biographies -- watch sci-fi movies, and play video games." As the date of her roast approaches, she expressed her gratitude for being considered a worthy target. "Arriving at 'legendary' status is another thing entirely," she said. "I certainly feel greatly supported by a wonderful community and am frequently surprised at the respect and deference they offer me." The Roast of Donna Sachet will be held this Saturday, September 29, at 7 p.m. at the Castro Theater. Tickets are $30-50, with VIP seats for $150. Attendees must be 18 or older.